Have you noticed all the hot – and erratic – weather this summer? 2010 is likely, but not certain, to be the warmest year in the GISS record. However, because of the cooling effect of La Niña in the remainder of the year, there is a strong possibility that the 2005 and 2010 global temperatures will be sufficiently close that they will be practically indistinguishable. The location of extreme events in any particular month depends on specific weather patterns, which are unpredictable except on short time scales. The weather patterns next summer will be different than this year. 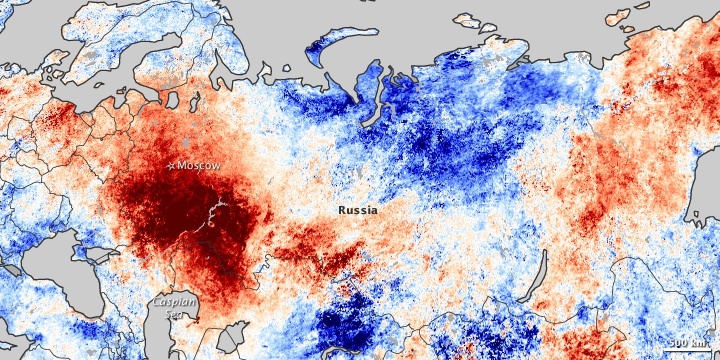 It could be a cooler than average summer in Moscow in 2011…What we can say is that global warming has an effect on the probability and intensity of extreme events. This points to the distinction that scientists are always making between weather and climate. Solar activity, El Nino or even volcanic eruptions can affect the weather and temperature over a short term. But when it comes to classifying what is happening to the climate, the trend must be clear and free of these influences. The climate “signal” must emerge from the data over the course of at least a decade. What’s happening with the global surface temperature record fits this bill, Hansen said in the draft paper. Despite El Ninos, La Ninas, changes in the Arctic Oscillation, fluctuations in the sun’s radiance, snowy winters and cool summers, hot summers and warm winters, the continued trend of the average global surface temperature remains on an upward climb. To learn more about NASA’s surface temperature record, visit this temperature update from earlier this year. Also, you can visit GISS’s technical page for detailed information about GISS’s surface temperature record.